Note: You can only enable one payment gateway. This is also a single currency only service supporting the base currency of your Saasu accounting file. 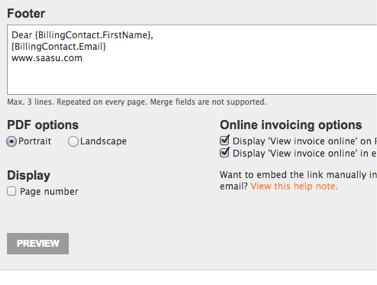 Here’s how you can easily enable online invoicing in Saasu, so your clients receive online payment details with their invoices. All four providers require different credentials. Follow these specific instructions for your current provider below and then come back here and complete the final steps. Now that you’ve setup your preferred payment gateway, it’s time to enable online invoicing on your templates, so that a link for online payment gets automatically added to your invoices. 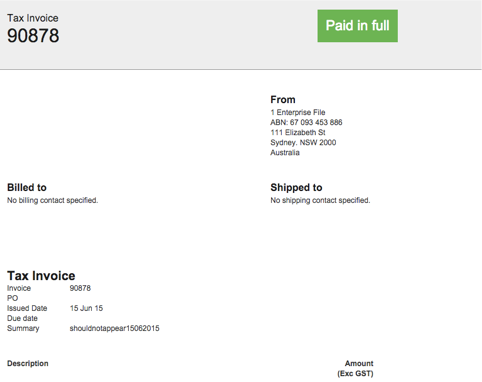 You can use Online Invoicing on Standard invoice templates that use in-built themes (these are the non-customised templates that come with Saasu). This is how you do this. 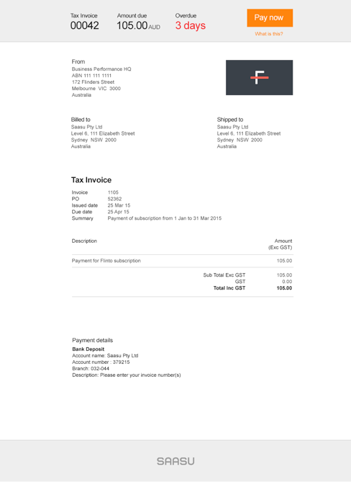 Now your invoice template is ready for online invoicing. You can customise the look and placement of the payment link in standard templates by using a specific Saasu merge field. There are 2 different merge fields you can place in your template depending on your needs. You can do this in the Content Tab of the Edit Template screen. This merge field will substitute the “View and Pay this Invoice Online” hyperlink that links to your sale wherever it is located in the template. This merge field will place the entire link wherever it is located in the template. 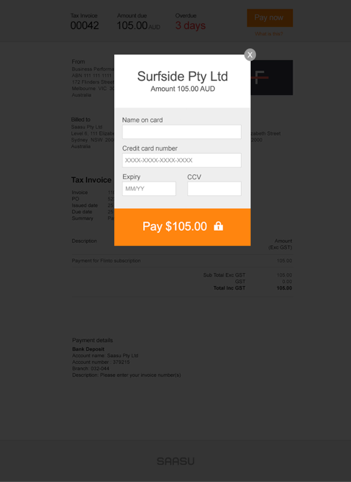 This article Stylish Pay invoice online button from our technology partner Xfive shows you one way of creating stylised buttons. 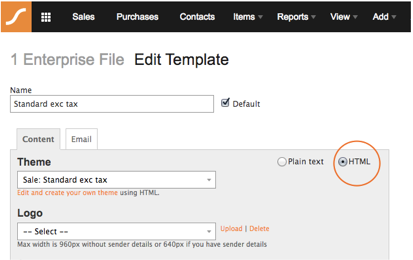 Learn more about customising your templates. 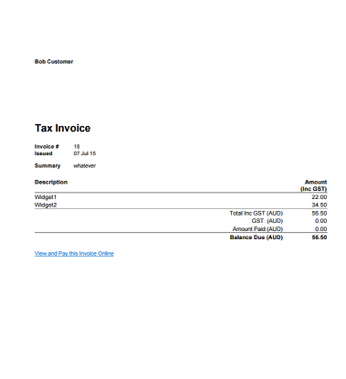 Now that you’ve enabled online invoicing on your template, you’re ready to start sending out invoices to your customers. When they click the Pay Now button above, they will be prompted to enter their details. When the payment has been made successfully, the invoice will be marked as paid automatically in Saasu and a receipt will be sent to your customer, without you having to do anything! Simple and easy. BPAY is a payment process used in Australia. Businesses wanting to be able to receive BPAY payments will need to contact your financial institution to apply. As part of the sign up process, you will be provided with a BPAY Biller Code and the BPAY Operations Manual. You can then provide these in your Saasu Invoices so your customers can pay you. Below we provide some ways to help you do this. How you provide a reference number to your customers is quite important as it may impact reconciliations and other workflow. Generally speaking unique numbers of each payment help you assign the payment to the correct transaction but require your customer to enter a new unique reference number each time they pay you. Alternately a static number is easy for your customers and reduces their input/entry risk but it may add to your reconciliation burden. Saasu can only support static CRN’s as we don’t yet support CRN generation. You can create a static CRN for each customer using BPays CRN tools. Go to View > Templates. Open your template by clicking on it and navigate to the Payment area. 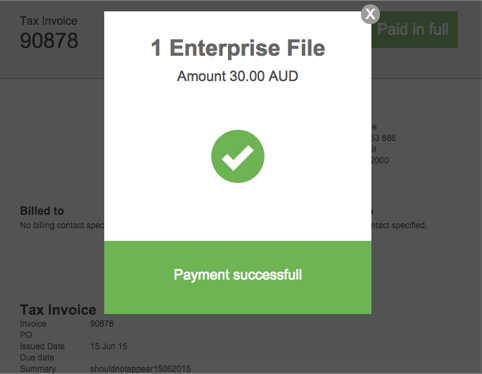 Can I add the online invoicing option to my recurring invoices? Yes, you can. Just follow the exact same steps to add the payment gateway and enable the online invoicing option on your preferred template. Then go to Automate > Recurring Sales > Choose the sale you want to run online invoicing for. Ensure the correct template is selected, save the details, run a preview and the next invoice will be sent with the online invoicing added to it. Can I add a credit card surcharge to my invoices? Yes, you can add a credit card surcharge as an additional line item on the invoice. One thing to note is that, if you offer more than one payment method, this surcharge will still be displayed, as there is no way of excluding it automatically if your customer chooses to pay via a different method. What are the advantages of not charging credit card surcharges? As more revenue is pushed through a credit cards the rate you pay falls. We’ve seen rates ranging from 1-1.5% in small businesses even in the 500k-2m turnover category. If prices are adjusted up to cover credit card fees then you remove the click/buy barrier that credit card surcharges are known to have. If half your business is credit cards and you’re on 1.5% fee then you would only have to increase prices by 0.75% to negate it. We’ve found credit cards increase payment probability because they are convenient. Direct deposits are more accounting heavy. There’s increased risk of the sale not happening. The affect on cashflow from an Accounts Receivable perspective justifies it in our own experience (it may not in other business models). Test you view on this from the consumers perspective. What if Apple, MacDonalds or KMart started charging surcharges for using a credit card. Mostly an honest reaction to credit card surcharges is negative nearly all the time. Can I use online invoicing for transactions in currencies other than my base file currency? No, online invoicing is available for transactions that are in the same currency as your base file currency only. Can I connect multiple payment gateways? No, you can connect only one payment gateway, either Braintree, eWay or Stripe.